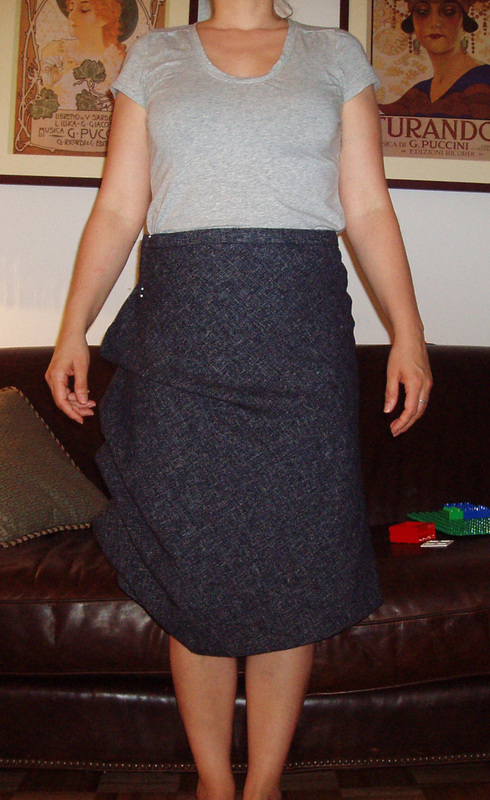 This entry was posted in Beginner, Sewing, Skirts, Stupid Mistakes. Bookmark the permalink. Ohh Elizabeth, you would be disappointed. And there’s not a thing I can do to help you, I don’t think. I am wondering, perhaps your fabric is not as firm a weave as Cidell’s is? I do hope someone comes up with an excellent idea to help, as that is a lovely skirt. what a shame. I too am thinking it must be the weight and hand of the fabric – too drapey, not enough hold. If that is the case, and it’s hard to know without feeling the fabric, then I might experiment with topstitching the pleats into submission. A different look, possibly a bad one, but what have you got to lose? I can only guess that your fabric is much drapier than Cidell’s – how frustrating for you. As for fixing it, can you unpick the lower side seams and try taking a bigger seam allowance on the front only to pull in some of the excess fabric? Or put in lots more pleats? Or anchor the pleats somewhere other than just at the side seams? All these will give a slightly different looking skirt though, I think experimenting with pins is the way to find out what will work best. Oh dear, something went wrong (though you look lovely!) You can see that Cidell’s version has some drape in the front hem area too – but it does fold correctly. Tough to tell without a hands-on – especially between your skirt and Cidell’s. Your two best resources on this one are Thea and Cidell. 1. Can you e-mail or call Cidell and talk with her? 2. Maybe going between the fabric and lining and iron in some interfacing over the whole front – but don’t do that until you consult with Thea and Cidell. 3. Maybe the fabric is just wrong for that skirt. Or maybe it was cut on the grain line wrong? 4. Can you cut a new front? don’t let that throw you – we have all done some drastic makeovers. I am just finishing up taking off a blouse back and cutting a new one – it happens. 5. Notice also this line from Cidell’s blog – “The fit took a lot of tweaking, Knip Mode seems to have more ease that BWOF.” Maybe it is as simple as too much ease? darn you put alot of work in already. i am sure it is salvageable, interfacing is a good idea! maybe not exactly that pattern. i think this is why draping is a big deal! what fabric suggestions are on the pattern envelope? not that i ever even look but i should. I agree with everyone else – I think it is a “too drapey” fabric issue rather than anything you did wrong. I’d try the interfacing on the front panel, and if it looked too worked over at that point from playing with it, I’d cut a new front if I had more fabric and wad it if I didn’t. But that’s me – I don’t hesitate to throw something out if it pisses me off. I think the first think you should try is a good firm interfacing on that front panel. Comparing Cidell’s, her pleats don’t droop beyond their fold too much, so I think all you need is a little more body. If the interfacing doesn’t work–well, I’d go ahead and call it, but you could also try shortening that overlay panel so the pleats are more a suggestion of a pleat. I’m looking at it again and I have a new idea (better than the not helpful shrug I emailed you earlier). I still think the fabric is too drapey. But, let’s talk about your lining. Can we see it from the inside? I’m curious about the ‘bagged the lining’ comment. I feel like mine was almost an underlining to add additional structure. And, I still remember having to remove some length from the bottom of the skirt. Can you show it to use unbuttoned, like I did? I want to see the ‘fall’ or ‘shape’ of it. Ok, I’m also going to bring my skirt with me to Philly and the magazine. I’ll vote for the fabric as well. I didn’t realize until I looked at the button post that I have the same fabric, and I think unless it’s firmly interfaced, you might have the droop issue. (Didn’t realize that until I just went in and pulled the fabric off the shelf and felt it, so I wasn’t trying to confuse you yesterday when you called about interfacing under the buttons). I’m curious about how you “bagged” the lining too. Bring it with you. My first thought was the fabric itself. Then I read the other comments and realized I wasn’t the only one who thought this. It could also be the interfacing fabric like Cidell wrote. I am sure there is a solution. I’m counting on you, Sweetie. Hope you had a good trip home!